I am amazed at how much time has flown by since I posted Are You Addicted To Sugar? I felt it would be important to share my journey so far. As a recovering sugar addict, I know many people will wonder what it would feel like to come off sugar in a world where we are surrounded and encouraged to take in sugar every single day. My journey has gone amazingly well. I am surprised I have not fallen off the detox wagon, but I feel my investigations into the role sugar plays in so many health issues has really sunk in. Even if cravings arise and someone places a a cake in front of me, I would not choose the cake, I would choose my health. So, 18 days now without eating sugary products. My first week was probably the hardest. Also discovering throughout this journey that even cereals on a low GI diet that are recommended, are something I had to let go of. Instead of my usual cornflakes and a spoonful of sugar with milk each morning I changed it to All-Bran. I thought I was doing the right thing until I checked the ingredients and realised the amount of sugar that the company adds to All-Bran was equivalent to what I put on my cornflakes. This horrified me at the time, as I thought I had gotten really clear on products that contained sugar but I was wrong. Most commercially sold cereals have added sugar in them. And, I wondered why I enjoyed the taste of All-Bran a little too much. So no more All-Bran, and no more commercially produced cereals for breakfast. Now, being on a budget, changing my diet has been somewhat of a challenge, but I have had to do what I can with the options I have, and in the future I hope to go more organic, but for now, I am making the best of it. In the first week I craved chocolate the most. TV adverts were a challenge. And as I am on social networks a lot, companies sharing doughnuts, chocolate, cake etc etc… was slightly tormenting to the say the least, but something in me was very disciplined. I sought out alternatives to snack on, to help me through my cravings and they worked and help me a lot. To add to my sugar detox, I have had a lot of back pain as I am recovering from neural tension right now and so with often-intense pain the cravings were bigger. It’s understandable, any kind of the pain in my past, be it emotional, physical or mental, anguish resulted in my reaching for the chocolate bar or anything sweet, so I am very proud of myself that I have gone through this when in pain and still not indulged in my old crutch of chocolate. Now, many sites say you can have side effects from letting sugar go, headaches, skin breakouts and other issues. I have not had any, but I think it is because my skin was in such poor shape from hormonal imbalance and from overindulging in sugar over the years that it is probably very relieved. I had a slight headache during menstruation but that is not unusual for that time of month for me. So, you may be asking how on earth have I coped? What have been my coping mechanisms? My main coping mechanism has been drinking plenty of water and herbal tea. I have not totally cut out coffee, but it really tastes different without sugar. Instead of having 2 cups daily, I am having one small cup every 2-3 days instead. I have also had plenty of protein and fat in my diet. And don’t feel scared you will put on weight. I have lost around 5lbs which is a nice steady weight to lose and this was not intentional. So long as you eat in moderation and do not have huge meals, you can have very fulfilling meals during your detox. Porridge with sliced banana and walnuts. 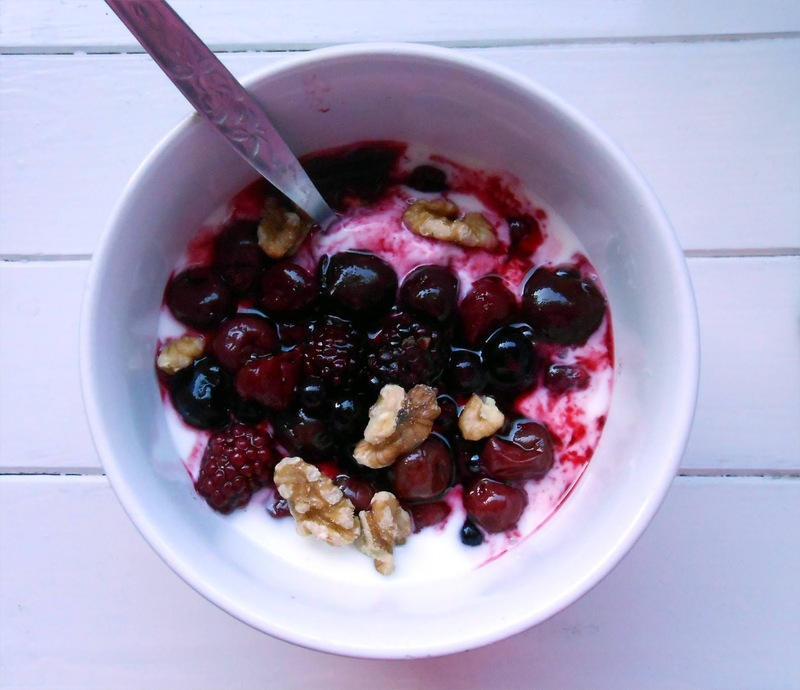 Natural yoghurt with fruits and berries (I bought frozen). Wholemeal toast and scrambled eggs. I am waiting for a delivery of both Kamut flour and more Buckwheat flour so that I can have once a week pancakes or breakfast muffins. I also want to make my own bread as all shop-bought bread in supermarkets, even if it is says it is wholemeal in large letters, actually has white refined flour in it too. This is to make it extra fluffy and not so heavy for those who buy it. Personally I find it completely deceptive marketing to say it is wholemeal when it clearly is not. I am cutting out refined flour also, as white flour is much like sugar in that it can cause blood sugar to go up and down. You can also have savoury breakfasts, meat, bacon, eggs.. but I personally would not have this every day, just mix it up a bit so you don’t get bored. It has been strange not having sugar in the morning, so I made a substitute with bananas. I have not gone into other sugar substitutes like agave nectar or honey yet. I wanted my taste-buds to get used to less sweet products and just to get that from natural fruit sugars. Ryvitas (rye crispbreads) with a spread of cream cheese (I use Philadelphia) and a couple of slices of thin ham. Some ham has a lot of sugar added to it but some of the wafer thin ham has negligible amounts. As I said in my other blog post, food companies add sugar to pretty much everything, so read the labels when shopping. Also if you have fat, or dairy with anything that contains sugar, it slows the absorption of sugar into the blood stream. Again, moderation, I don’t like to have a lot of dairy. Hummus on oatcakes. I have around 6 oatcakes with around 70g of hummus, this way a single pot lasts me 4 days for lunch. Leftover food from the main meal the night before. 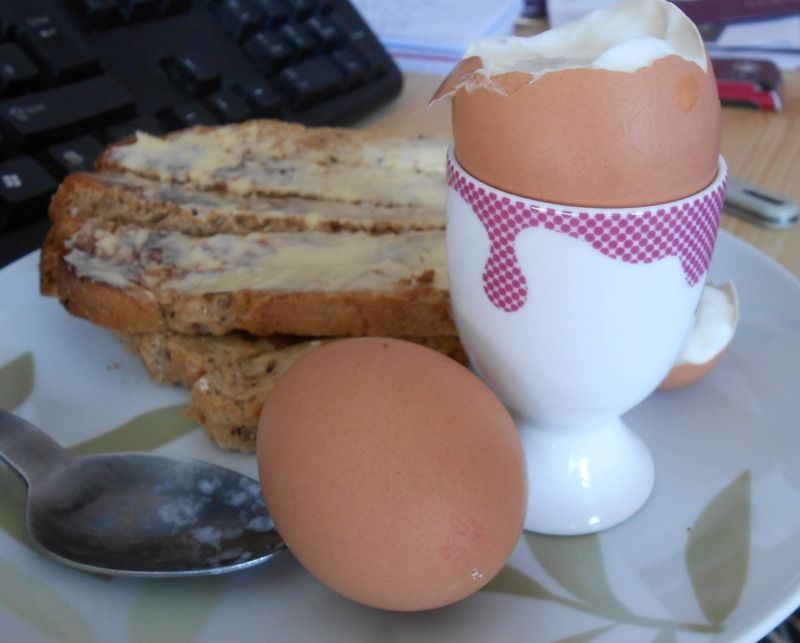 Soft-boiled eggs and soldiers. Butter on toast, not margarine. 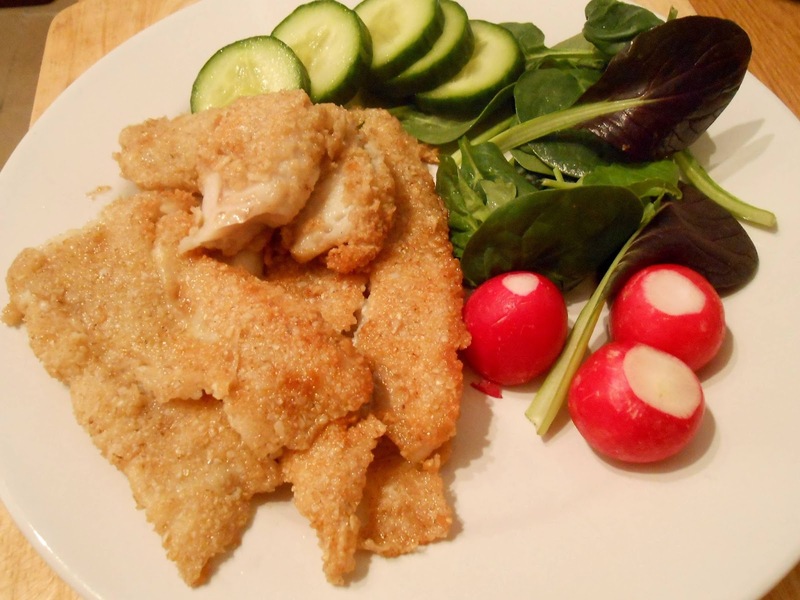 Pollock coated in an egg/milk mix, rolled in oats and fried and served with salad. 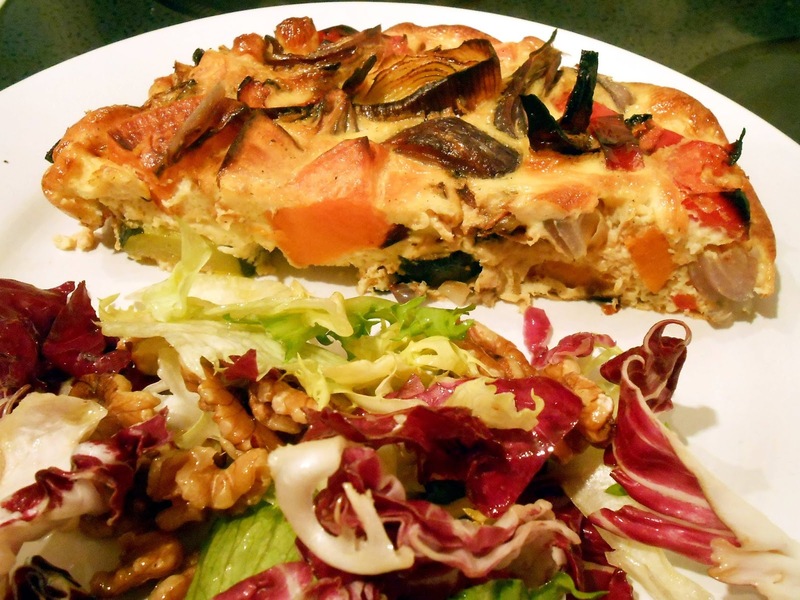 Roasted vegetable fritatta (you can have ham, meat, potato in it if you want, there are many recipes for this online and it’s so deliciously filling) I have this with vegetables or salad. Chicken Cordon Bleu – chicken wrapped in bacon and covered in a Swiss cheese and finished with Parmesan served with vegetables cooked in butter. Fried breakfast – egg, bacon and mushrooms – sometimes sausages, but check the sugar and flour content (I grill the bacon). Fish fingers, peas and carrots (yes, you can have this child-like favourite- just leave off the tomato ketchup or mayonnaise) I like to sprinkle it with lemon juice or vinegar and salt. Fish fingers do have some refined flour in the coating but its negligible and low GI. Now for what I imagine most of you are asking, what on earth can I have instead of chocolate, cakes, sweet foods for snacks when I am going through the major craving phase or just feel a little peckish? (apart from liquids). If feeling emotional and you really cannot find a way to soothe yourself without anything digested, I go for a cup of warm milk. Sliced apple, sprinkle cinnamon on the slices. This is a brilliant craving stopper and a twitter friend who recommended it also said you can heat it a little in the microwave and top with sliced almonds for a little makeshift apple pie. And my favourite is sliced apple with peanut butter on top. 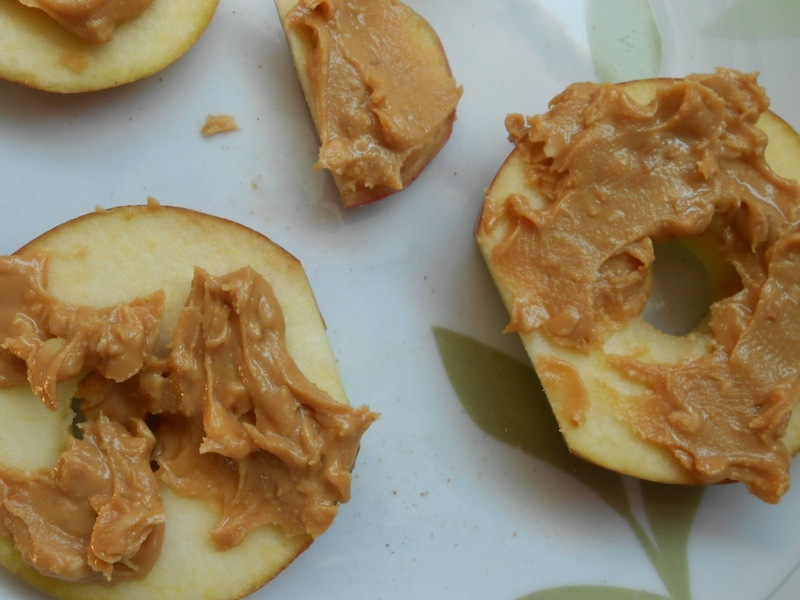 With this snack you get all the goodness from the apple or the good oils, proteins from the peanut butter and this is not something I would have ever put together but it works really well. 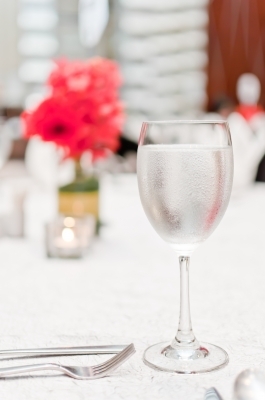 If dining out choose wine, dry cider instead of beer or sweet cider. Preferably red wine the experts say – I choose white wine as red gives me a rash on my face. I think it’s possibly too soon to measure the changes in me, especially as I am healing from a back issue, but I must say my mood fluctuations have been considerably less considering circumstances right now. And my bowel movements are more regular and easy, whereas before I was lucky to go once a day and was often constipated. After a month I will do another update to share the changes taking place. Good Luck and any questions just ask.